The design offers you cable storage, accessory storage and a big tool deposit to keep all you need at hand. 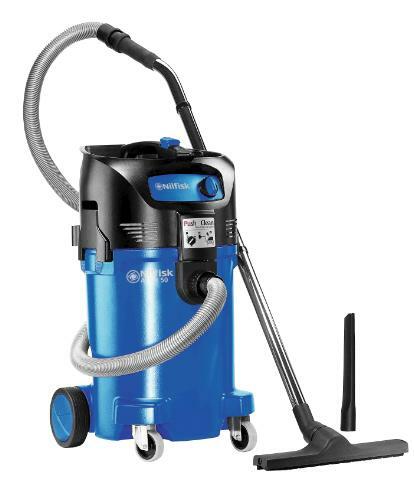 The larger size of the ATTIX 50 allows you to work longer without emptying the container, and with the wide range of available models, it's difficult to imagine that you won't find a perfect match for your wetand dry vacuum cleaning tasks. The -21 models are equiped with a convenience socket so no need for a extra extension cable, just plug your tool into the vacuum cleaner. Automatic On/Off (-21) models are the choice of people who use the vacuum cleaner with electric hand tools because starting or stopping the tool starts and stops the vacuum, as well. An optional Airbox is available which performs with the same function when using pneumatic tools.